For those thinking that Hugh Jackman’s final exit from the Wolverine character would be nothing but an exercise in the same origins story told twice before (and fairly poorly, I might add), prepare to be pleasantly surprised with Logan. This departure from the regular superhero comic book (okay, graphic novel, if you will) adaptation takes a dark and gritty turn (think “Deadpool” without the laughs or language) almost immediately with Jackman (“Eddie the Eagle”) playing a bitter, down-on-his-luck limousine driver in the year 2029 who spends his time drinking, brooding, beating up Mexican car thieves and caring for the aging and seemingly addled Dr. Charles Xavier (Patrick Stewart, “X-Men: Days of Future Past”) in a vacated south of the border industrial plant. He is aided in this last endeavor by the mutant albino Caliban (Stephen Merchant, “Hall Pass”). Then things begin to get complicated. First, Logan (aka Wolverine) is tracked by a hysterical Hispanic woman dragging a moppet who looks a lot like Christina Ricci in “The Addams Family” in tow. It seems the lass is a genetically-engineered mutation just like he is (with retractable claws, plus defensive — and deadly foot razors). The lady, a nurse, has phone camera evidence of an American genetics company located in Mexico where children are routinely experimented upon and turned into cold-blooded zombie-like killer/weapons. 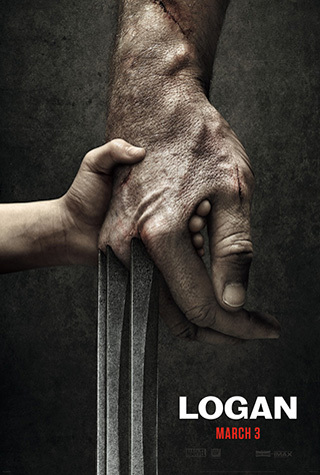 She is quickly dispatched, though, and the violent young girl, Laura (a spunky Dafne Keen in her debut), is whisked away by the two X-Men, even though Wolverine has little need or affection for the mute child. Meanwhile, a slick baddie from said firm, Pierce (Boyd Holbrook, “Morgan”), and what seems like thousands of heavily-armed henchmen, are in hot pursuit, chasing the trio through Las Vegas, Oklahoma and finally North Dakota, where the escaped children plan to cross the border into Canada. The villains are then joined by the evil Dr. Rice (Richard E. Grant, “Jackie”), who operated on Laura and the kids and is the son of the infamous Dr. Rice who mutated Logan himself. In an attempt to capture and gather the tykes back to the institution, Pierce, Rice and Co. expend thousands of bullets and lives in this effort. You see, Wolverine is a tough enough mutant to deal with, but add to the mix the lithe and deadly Laura and Charles (who can still telepathically blast bad guys away whenever he has a seizure) and the firm sustains almost unbelievable casualties (via slicings, dicings, decapitations, hearts being ripped out and other assorted maimings which not only entertain, but give the “R” rating this feature proudly exhibits). Leading this barrage is little Laura who is not only catlike, but is just as fatal as Wolverine, and easily kills more humans than Pol Pot and makes Hit Girl look like Mother Teresa. Director James Mangold (2013’s “The Wolverine”), who also co-wrote with Scott Frank and Michael Green, evidently has a lot of respect for the character and seems to revel in this restrictive rating which will keep families away, but adds a wonderful and emotional depth to this genre of movie (although, after a while one is hardly watching a superhero film at all, as it is almost as depressing as “Manchester by the Sea” or “Moonlight,” but with hundreds of murders). There are also more than enough heartrending scenes as several characters sing their respective swan songs to bring this particular film saga to a fitful conclusion. And, if one counts Logan as a part of the actual “X-Men” franchise, it is one of the best of this series as well, which is so far removed from the last installment, “X-Men: Apocalypse.” Jackman gives an understated performance (showing more with a squint or a grunt than most actors give with two pages of dialogue) that brings his pain and inner turmoil to the surface and offers full closure to the mythic semi-mutation. Stewart is also marvelous here playing the crazed professor who also just might be as crazy as a fox. I don’t think it could have been better. What a proper send off for both Hugh Jackman and Patrick Stewart. They’ll be sorely missed. Damn good movie. The best of the X-Men franchise and finally one befitting a badass like Wolverine. Too bad it is Jackman’s last go with it. Stewart too. He brought a level of acting sophistication to the superhero genre before it was the in vogue thing to do. That is one vicious little girl. She is more wolverine than Wolverine ever was. She acted like a feral cat trapped in a corner even when unthreatened and killed with extreme prejudice when she was. This is the first superhero movie that resonated with me emotionally. I sympathized with Logan and his want for acceptance and knowing only loss, I feared for Laura and her uncertain future and I wept for Charles whose dementia stole a brilliant mind. Holy christ this is a brutal movie. There are some deaths in this that are beyond graphic and far beyond anything ever done in a comicbook movie. Definitely not meant for the younger crowd or people averse to blood. Loved it, but where do they go from here? Start the X-Men all over again again? Movie forward with X-23 and a cast of new mutants? Crossover with Deadpool to become The New Mutants. And I imagine a bunch of X-Men prequels and alternate timeline stuff. Been saying it for years – Don’t Eat GMO Foods. They’re poison. Excellent goodbye to Wolverine. My favorite anti-hero went out a hero, a father and a best friend. It could’ve done without all the ‘f%cks’ and maybe even some of the gratuitous violence but overall it is a good movie and Jackman’s best turn as the Wolverine. Will be interesting to see what they do with the character after this. The Deadpool effect has already begun on the superhero genre. Can you imagine them making Logan with a “PG” rating? It would have ruined the visceral feeling they were aiming for..